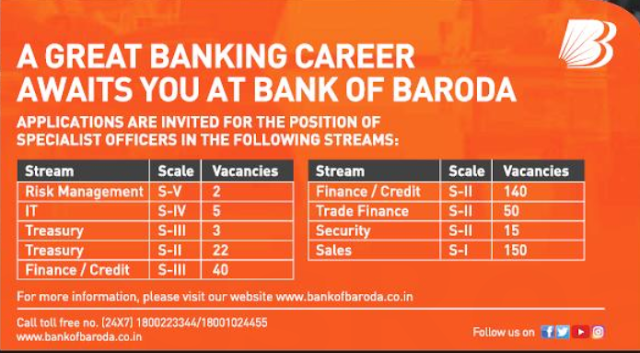 Bank of Baroda offering Great Banking Careers at Bank of Baroda 2018. BoB invites Online applications from Eligible Indian Nationals for the position of Specialist Officers in various Streams. Other details like age limit, educational qualification, selection process, application fee and how to apply are given below. Candidates have to make the payment of requisite fee/intimation charges through ONLINE mode only. The candidate is required to pay the non-refundable application fee/Intimation charges irrespective of whether the online test is conducted or not and even if the candidate is shortlisted or not for the interview.